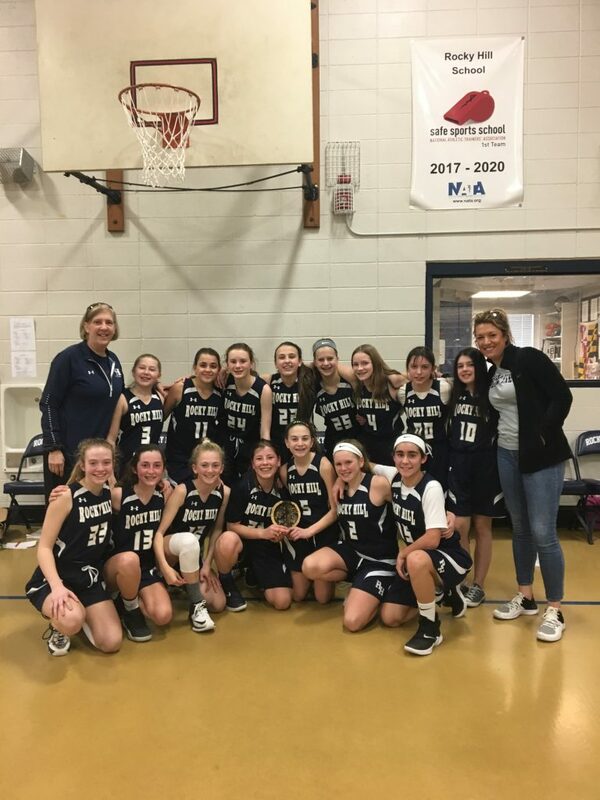 MS Girls Basketball took THIRD place in Land of Fires Tournament 2019! In the opening game, the girls played an exciting game to maintain the lead and beat Paul Cuffy with no time left on the clock. The defensive pressure and the well executed offense made this a total team victory. It was an exciting game, and allowed us to continue to play on Thursday. Which was one of our original team goals in the beginning of the season. Franny McCaughey, Katie Kerachsky, Skye Connell, and Tina Greim, all contributed 4 points each, and Sydney Boss and Lexi Cote finished out the scoring. The team started strong and kept BVP within reach. However, as the games pace picked up, our players just ran out of energy. They played hard, but couldn’t maintain the fast pace transition game to stop them. Even switching to man-to-man, didn’t give us the boost we needed to win. The highlight of the game was when the 6th grade squad went in to play at the end. They played hard and showed us what to expect next season! The key scorers were Skye Connell and Katie Kerachsky each with 4 points, Lexi Cote with 3 points and the other scorers were: Franny McCaughey and Tina Greim. The girls started on a slow, non-energetic note in the first half and were down (5-10) at halftime. However, with the exciting shooting of Kristina Greim, Skye O’Connell and Franny McCaughey each contributing 6 points and the leadership of Katie Kerachsky, the team’s energy doubled! During the press and the defensive pressure of Franny McCaughey, Hannah Boss and Sydney Boss, Pennfield never had a chance. The real energy came from the 6th grade players who were amazing on the bench. They consistently cheered and pumped everyone up! This was a true total team victory! 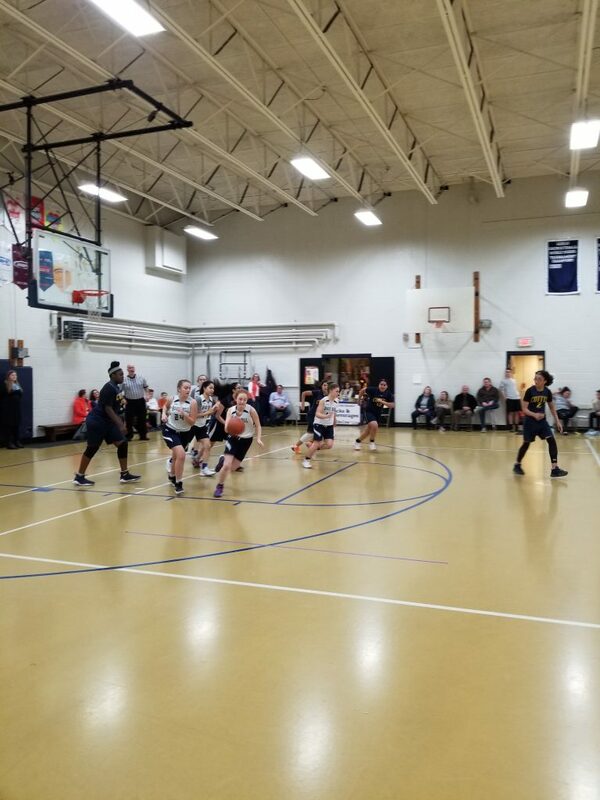 Girl’s Middle School – Seventh game of the season! The whole team did a great job being strong and not becoming frustrated. There was a definite size difference between the two teams, but we went out and played tough and strong. Tina Greim played a wonderful game offensively. Skye Connell had her best game of the season both offensively and defensively. The eighth graders led us the team, but the sixth graders showed their strength by jumping into the game and playing tough. The team was very proud of how they played this game as they should be. Great work! 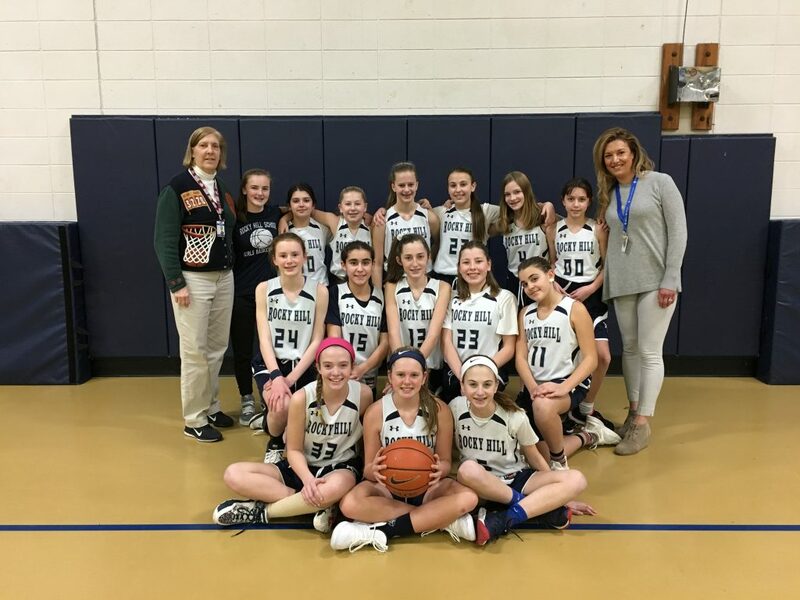 Girl’s Middle School – Fifth game of the season! Skye O’Connel 6pts. Sydney Boss 2 pts. Skye O’Connell had six points! She really has been a strong player under the hoop. Our 8th graders did a great job leading the younger players who had significant playing time this game. Although Gordon was physically stronger we played with great strength and perseverance. For those that were afraid due to size they stepped up and played great defense! The third game of the season is a victory! Lexi Cote & Skye Connell were dominate under the basket both offensively and defensively. Franny McCaughey, Katie Kerchasky and Sydney Boss did an amazing job helping led the team. Our 7th & 8th graders blended nicely together while running our offensive plays. Our 6th graders all had an impact on today’s win with playing time, and cheering! This is our first win of the season!! Tomorrow we will be playing away at Barrington Christian Academy! 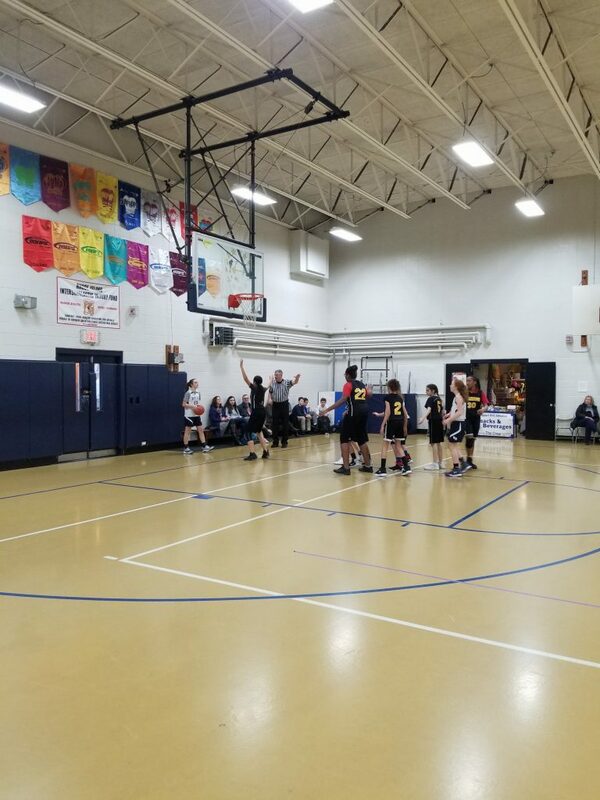 Girl’s Middle School – Second game of the season! Kristina Greim 6 points; Katie Kerachsky, Sydney Boss each with 2 points. Franny McCaughley lead the team with steals and rebounds. Her aggressive play along with the leadership from Lexi Cote, Hannah Boss and Orabell Picolli helped keep the team in the game until the end. The younger players, were introduced to our full court pressure, that brought us into the game after halftime. Next week, the girl’s will face St. Michael’s at home on Monday! 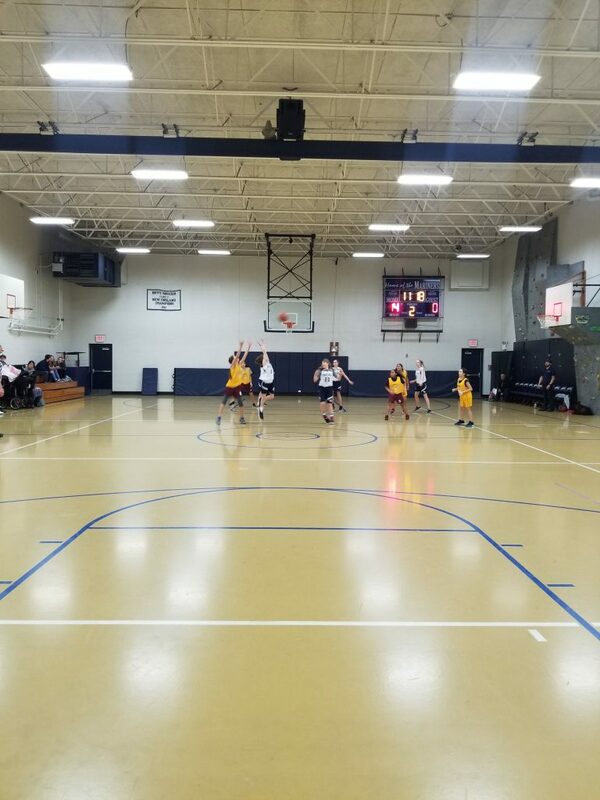 Girl’s Middle School – Opening game of the season! Kristina Greim 5 points; Katie Kerachsky, Lexi Cote, and Skye Connell each with 2 points. Franny McCaughley, Katie, and Hannah Boss were aggressive on the defensive end and helped run the offense. It was great to see Lexi Cote, Skye, and Sydney Boss solid in the paint against their larger players from Gordon. Since it was our first game, the sixth graders were introduced to a truly fast paced game. We did see solid rebounding from CeCe Tamburini and Jillian Pogachar. Next week, the girl’s will face Community Prep at home on Tuesday! The RHS team lost a tough opener to Community Prep 15 – 26. RHS never really took the lead and struggled to maintain the fast paced, aggressive style play. Leading scorers were: Charlotte Boss 10 points and Kaeley Zito 5 points. The RHS team put on a show with a double overtime victory against Paul Cuffee. At one time, RHS was down by 16 points and fought hard to catch up and tie the game with a three pointer from Charlotte Boss. Excellent defense was played by Rachel Arabian and Nicole Xing. Kaeley Zito and Charlotte Boss each had a double, double with points and rebounds or steals. It was the most exciting game in the past few years. The Girl’s A team lost a tough game against Times Academy, 19 -50. It was a fast paced, aggressive game, however, the RHS players couldn’t keep up. Leading performances were by Charlotte Boss with 7 steals and 5 points, Kaeley Zito, 7 points, Lily Kerachsky 4 points and Kristina Greim added 3 points. The Middle School Tournament starts next week. 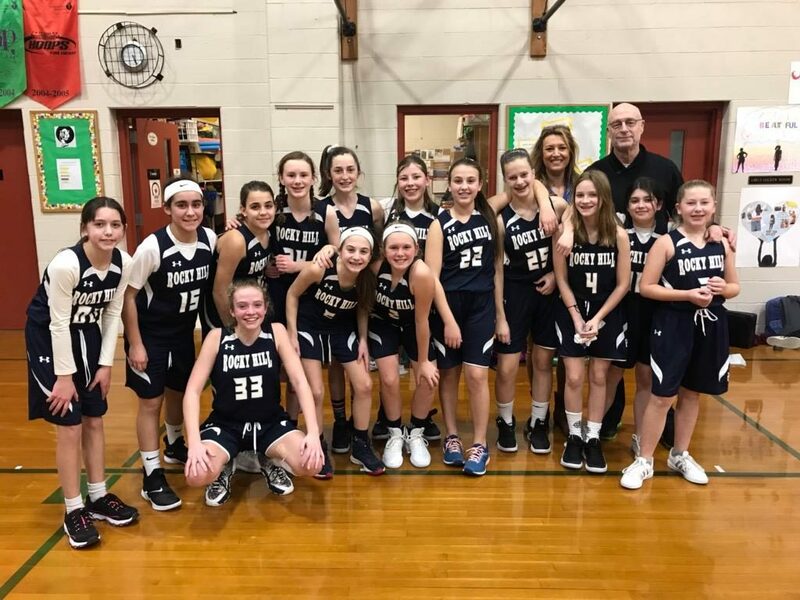 The Girl’s Basketball team played a combination A/B game against PCD and won 23-13. 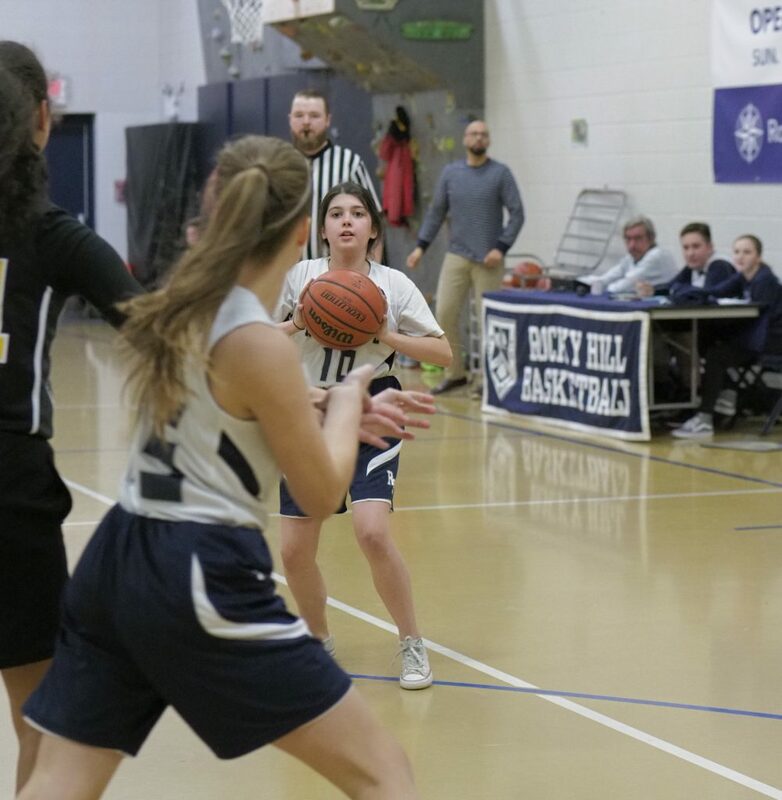 The highlights of the game were: Rachel Arabian scoring 5 points and one of them was her first three point basket, Kristina Greim playing point guard and scoring 9 points, and Kaeley Zito leading the group as a captain and scoring 9 points.